An AMC facility where trainee mariners learn how to fight fires at sea is now being used by the Tasmania Fire Service (TFS) to simulate urban emergencies. More than 70 career and volunteer firefighters recently completed a six-week compartmental fire behaviour training course which was led by the TFS in partnership with Fire and Rescue NSW Urban Firefighting College and delivered in collaboration with AMC at its Marine Firefighting Training Centre. 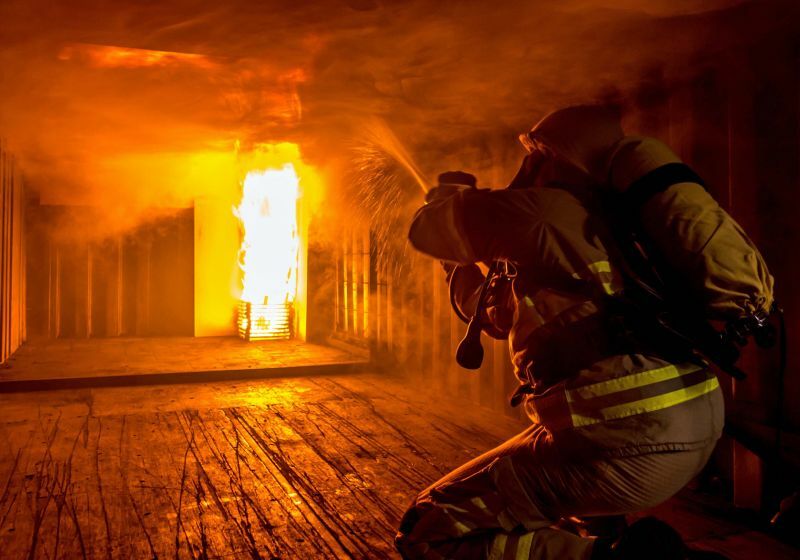 After completing an intensive classroom theory session that covered the basic principles behind fire behaviour within structural environments, the teams faced the heat inside a live fire training prop – two customised shipping containers configured to create the conditions they might face inside a typical urban dwelling. AMC Emergency Response Centre Manager Anthony Beckett said it was rewarding to see AMC’s facilities and resources in action to help the TFS achieve their training outcomes. “Our Bell Bay facility caters for live fire training, and its industrial location means we have enough room available for custom training props to be set-up and used without interference or interruption to other operations in the area. This satisfied the training and operational needs of the TFS and allowed us to showcase the capabilities of the Marine Firefighting Training Centre outside of its traditional maritime application,” Mr Beckett said. Tasmania Fire Service project officer Rick Mahnken said firefighting had changed considerably over the past 50 years and this training brought crews up-to-speed with contemporary practice. “Buildings are constructed differently now, and the average home contains modern furnishings, which burn hotter and faster, and we need to be prepared,” he said. “This training brings firefighters back to the roots of their training, refreshing their awareness of the dangers around them, using their instincts and their knowledge, rather than relying on what they may or may not be physically experiencing. The compartmental fire behaviour course will provide benefits not only to the TFS crews but also to the AMC instructors who deliver internal fire response training. “The TFS members gained exposure to conditions that confront the firefighters of today, such as the build-up of unvented fire gases and extreme temperatures. AMC’s fire training instructors will also gain invaluable knowledge and experience through exposure to this type of training, and will have an expanded base to build into our own training programs,” Mr Beckett said. Mr Beckett said he intended to continue building on this collaboration with the TFS and hoped AMC’s specialist training facilities could be utilised further in the future.